A couple of years ago I was watching an Oprah show on healthy eating, where steel cut oatmeal was featured as one of Oprah's favorite healthy breakfasts. It was the first time I had ever heard of steel cut oatmeal, as I had always eaten the more common flaky kind of oats. When I did more research I found out that the difference with steel cut oatmeal is that it is made from oats run through steel blades, which slice thinly, leading to a more chewy and dense (aka filling) texture. Sounded good to me, so I went out and bought some steel cut oats! Trader Joe's Steelcut Oatmeal is a great alternative to preparing steel cut oats on your own, for those of you that are busy or don't like to cook (if you do, you should totally try making your own steel cut oatmeal straight from the oats). Inside the box are two pre-sized portions of brown sugar and maple syrup flavored oatmeal that you just place into a bowl and microwave to prepare. The portion size is very large and filling, and due to all the fiber, it is only 2 WW points (150 calories)! 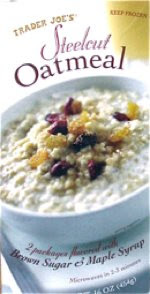 The oatmeal itself is pretty good, but can be bland (especially when you eat it a lot), so you might want to spend a point or two adding some almond milk, raisins or other fresh, dried, or frozen fruit, some yogurt, cinnamon, nutmeg, or even some nuts (especially if you are eating it for lunch). You can also add a 1 point piece of chocolate like my friend Evan blogged about previously. By adding a few of your favorite foods to your oatmeal, you can create a really yummy and healthy low calorie lunch option. Regular steel cut oats are made by a few different companies and can be found at almost any supermarket. The Trader Joes Steelcut Sugar and Maple Flavored Oatmeal can be bought at Trader Joes in the Frozen Section. Enjoy your steel cut oats! How many points does a natural sugar like honey or maple syrup use up? I love oats with just some maple syrup and cinnamon! Also, there is a lot of evidence that suggests that eating oats daily can help lower your cholesterol levels, so it is perfect for people who are trying to control their levels and their weight. Hi Edwin. Thanks for your comment! Points values actually depend on how much of a food you eat. Generally (though not always) a tablespoon of honey is 1 WW point, as is a tablespoon of maple syrup. But you have to check your brand to make sure. Maple Syrup and Cinnamon Oatmeal is delicious! I love oatmeal, it's one of my favorite breakfast foods. I think I definitely need to give this a try.